Burkina Faso is one of the poorest countries in the world. Drought, poor soil, a low literacy rate and an economy vulnerable to external shocks make Burkina a fragile state. Yet, the Burkinabe have a real desire to learn, transform their lives and hear about Jesus. Child labor, child trafficking, poverty and minimal natural resources have led to numerous challenges for the Burkinabe people. Even though the government continues to take steps to combat these and many other hardships, life can be difficult in Burkina Faso. Although few Burkinabe have had a formal education and the majority of the population is illiterate, the people are warm and resilient. Knowing the success and impact of the Feminine Training Centers in Haiti, the Village of Hope asked CWO to come to Burkina and establish a similar vocational training center. Ministry began in Burkina in 2001. The Village of Opportunity (VOO) has graduated three classes of young women. We’ve also completed construction on classrooms, dormitories, guest and teacher housing, a wall around the perimeter of the property and several other small buildings and projects. Now our students in Burkina live and learn in updated, safe surroundings. 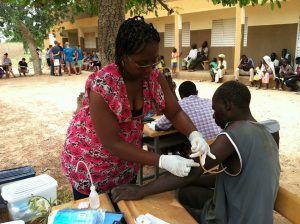 The CWO Mobile Clinic ministry began in 2010. Based in Ouagadougou, the capital of Burkina, the Mobile Clinic brings basic medical care and medications to small villages where people have little to no access to healthcare. We partner with small village churches and work alongside them to provide medical care and an opportunity for clinic patients to hear the Gospel. Many people have been healed physically because of the CWO Mobile Clinic, but even more people have heard the Good News of Jesus Christ because of the evangelical opportunities the clinic provides. Our vision is to continue to lead others to Jesus in Burkina! Read more about our programs in Burkina Faso in the sidebar to the right. Quick Fact – In 2015 the Mobile Clinic reached nearly 1,500 with the Good News. Click HERE to take a tour of our property in Burkina Faso! Making a difference ... in Burkina Faso! Many Burkinabe die from easily treatable diseases. Sickness and disease are a constant battle due to lack of disease prevention education and a lack of available healthcare, especially for those in rural areas. When possible, CWO also provides food during outreaches. The CWO Mobile Clinic aims to partner with small village churches to give them an opportunity to evangelize to their communities by offering medical outreaches at the churches. Burkina Faso is a patriarchal society where boys receive preference in schooling, so literacy rates among girls and women are far lower than their male counterparts. Many women have a very low self-worth and often resort to leaving school and marrying at a young age. The Village of Opportunity (VOO) provides young women with a Christ-centered training facility that helps them recognize their inherent value, learn a vocational skill and allows them to provide for their families. The VOO offers classes in sewing, cosmetology and agriculture. We help young women realize their God-given dignity and self-worth through biblical education, vocational training and loving encouragement. We’re thrilled that 23 of the 25 VOO graduates in 2018 decided to take the national exam, and 20 of those 23 passed. This outstanding statistic is attributable to our amazing staff in Burkina, the student’s dedication and hard work and an excellent curriculum. We hope to someday offer classes in cooking. VOO students also receive life skills while learning how to manage a small business and how to share Christ with others. In addition to providing life-giving skills to the students who attend, the VOO provides jobs for local Burkinabe. Students who graduate in the top of their class have the opportunity to become teachers as the school grows or participate in micro-finance loans to create their own businesses. Our first sustainability project is a new drip-irrigation agricultural project. There are three acres of cultivated, fenced, completely plumbed land that will provide crops for our students and, eventually, the community. We are working with another local non-profit who is committed to helping us make our program successful. Check back soon as this project gets underway! 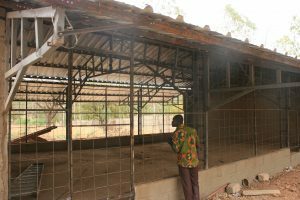 Now we have a Chicken Project too with a large chicken and chick coop where we plan to have 2,000 chickens in the next several months. This project will help generate income for our ministry in Burkina. The coop building is completed and we’ll be adding our first 500 chicks very soon. Staff, students and teachers have already volunteered to get the project started and will continue to be involved and in caring for the chicks. We’re excited about this project too!